Neo City can currently be accessed through Tera Forest, located east of Leafre. In order to access this area, you must do quest The Truth Behind that Man. The above quest is level 125. There are several time periods, but you must do the quests in each time period to open the next one. Each time period has it's own music and quests. Also, the quests are designed to do them as a "PARTY QUEST", although you can do them by yourself as long as you are leader of your own party. The quests can be found by looking in party quests off the main page under "Neo City Party Quests by Time Period". Each time period has its own party quest type. The farther you travel into the future the harder the enemies become. This is just any average town, found in the future era of Maple Story's world. Perhaps the advances in Magatia sparked this future. In this location, machines have not yet caused destruction to Neo City but roaming around are clues that might have led to the creation of high-tech robots that cause the destruction in the later years. A harbor late at night. Strange robots have taken hold of the ship-yards. This shows the emirgance of A.I. type robots, showing what is to come towards the future. Also, a large robot named Bergmot is here to defeat, located on the pier. A city at war with A.I. machines. The aftermath of the Dunas Missle Launch attack. The city is in ruins and it is your duty to try and help the survivors, if your up to it. Year 2215 - Bombed City Center Retail District. 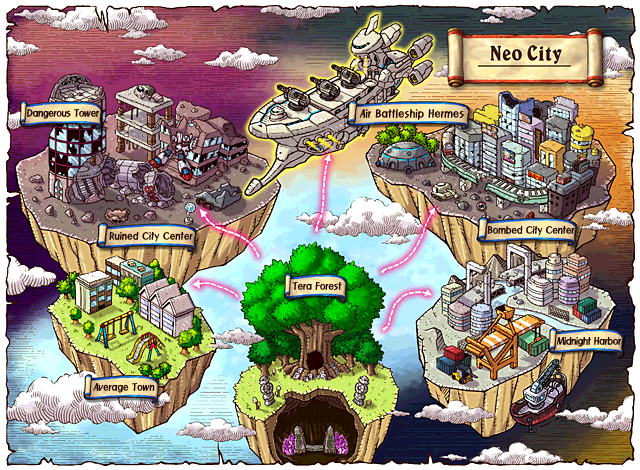 You can also look here for a general idea of what Neo City is like in other versions. It is called "Neo Tokoyo" in other versions.. This page was last edited on 1 June 2013, at 23:13.